The Adams fly is the most acclaimed fly pattern in the entire world. The original recipe for the pattern and the story of its origin has repeatedly been told and historically documented. 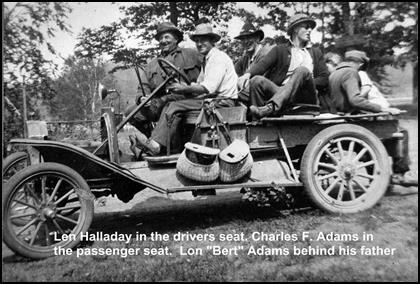 I have been researching Leonard Halladay (1873-1952) and the Adams fly for over three years. Almost daily more information and new contacts are discovered. It's time to complete the story and share with you new information that has recently come to light about the Halladays and the Adams fly. I reported in an earlier article that Len Halladay was born in New York. His family was originally from there but Len was actually born just south of Mayfield, Michigan. We know, through Leonard Halladay's grandson, Mr. John Falk that Len completed up through the eight grade of school. Back in the 1800s it was common place for kids to quit school at that age to begin to help to support their family. We also know that Len Halladay had several jobs the most noted of which was at the near-by hydroelectric plant. With a good job at the electric plant and a few bucks in his pocket Leonard eventually met and married the love of his life, Mary Marillus Koch, called "Rilla". They went on to raise six children. According to family history, Len was about forty-five years old when he was first introduced to fly tying by Ralph Widdicomb, the famous furniture magnate from Grand Rapids, Michigan. 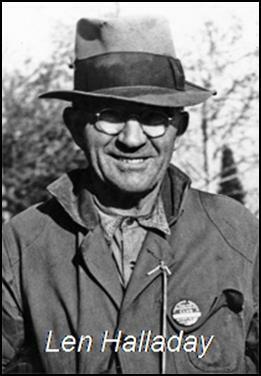 In an interview with Harold Smedley (late 1940s), Len was quoted as saying, " I have been tying flies since 1917. I haven't caught a fish on a baited hook for the last thirty-five years. I use the fly only." He later, tied for Ralph, one of Michigan's earliest patterns which he named the "Widdicomb." Leonard died on Thanksgiving Day, in 1952, followed by Rilla in 1959. Today the family continues with five surviving grandchildren. In 1903 Len and Rilla purchased the old 'Kelly Boarding House', which was home to many of the lumberjacks during the logging era of the late 1800s. The boarding house was located near the Mayfield Pond, which is a dammed up impoundment of Swainston Creek.Leonard and Rilla renamed the old boarding house the 'Halladay Hotel'. Their idea was sound. The Hotel was located just minutes away from the Boardman River. 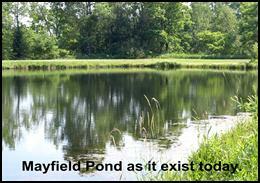 Between the hotel and the Mayfield pond ran the Grand Rapids & Indiana Railroad, with a scheduled stop at Mayfield. The tracks were literally just a few steps from the pond and the hotel. It was here that Len and Rilla would cater to hunters and fishermen from Indiana, Illinois and southern Michigan. Even summer residents of the area would take advantage of Len's hunting and fishing guide services. Len Halladay had two teams of horses and a buggy. After breakfast he'd drop off the fishermen to the hot spots on the banks of the Boardman River. Len would then return each afternoon to deliver 'bag' lunches to each of the fishermen. He would once again return in late afternoon to gather the fishermen. The horses were later replaced with Len's old Ford truck. Years later when the Halladay family donated the land to the township for the park, the hotel was so dilapidated that it just was not worth trying to save. Regretfully, the hotel was demolished. The Mayfield Park, just three miles north of Kingsley, Michigan, has been in existence since 1984. 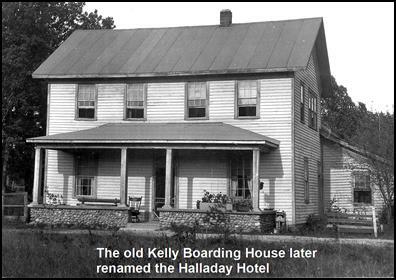 In 1989 the Halladay family donated the adjoining Halladay Hotel property to Paradise Township in memory of Len and Rilla Halladay. In 1991 the site was commemorated with a plaque donated by the Michigan Outdoor Writers Association. The township has built a pavilion at the location of the old hotel. 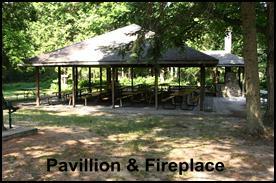 The pavilion contains a fireplace, the bottom half of which is original. The small park is very charming and well cared for. The park is open to the public, and I might add, the pond is still very fishable; home to some very large trout. John Falk, Len's grandson is in possession of Len's original tying bench, vice, tools and tying materials. He is very proud of the fact that he was taught, at a very young age, the fine art of fly tying by his Grandpa Halladay. He is knowledgeable about all of Len's original patterns and most, if not all, of Len's fly tying techniques. We now know that Len tied with both cotton and silk threads, which he waxed himself. He finished his flies with a secret knot that he called the 'Buggy Whip Finishing Knot'. He had attached to his bench an old bait casting reel which he wound his tying threads on. He simply adjusted the 'drag' on the reel to provide the exact tension he wanted on the thread. Because of John's input we now know that the Adams was originally tied with black thread. Just south of Mayfield lies the small town of Kingsley. In the town library is a small, modest exhibit which houses an original Adams fly tied by Leonard Halladay. Its home was carefully chosen by Edna Sargent, a close friend and neighbor of Len Halladay. Edna wanted the fly to remain as close as possible to its site of origin. The story is as follows…..
George H. Wells was a professor of microbiology at Ferris State University. In addition to that, he was an accomplished fly fisherman and a well known sports writer of the 40s and 50s. George summered at Spider Lake near Mayfield and knew Len Halladay very well. Mr. Wells was a frequent fisherman at the Mayfield Pond. In the summer of 1932 George went to Len's house and asked for one of his Adams 'original' flies. Len obliged. George saved and treasured the original pattern for years. He affixed it to a piece of paper and wrote: "This is valuable (about extinct) Len H- Adams. An original given to me in 1932 by the tyer." 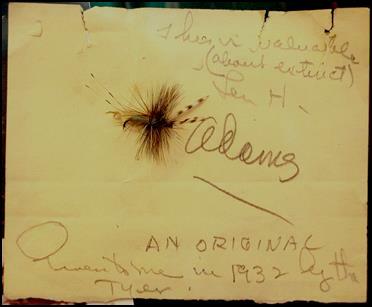 Mr. Wells bequeathed the pattern, along with a letter stating its authenticity, to his friend, Dr. Dan H. Gottwald, a serious fly fisherman with a deep respect for the history of the fly. Dr. Gottwald felt that the fly should be returned to its home and contacted Edna Sargent. In his own words, Dr. Gottwald says: "I presented this fly to Edna Sargent for display at the Grand Traverse Historical Museum. This exhibit was disbanded and basically put into storage at the Grand Traverse Historical Museum. The fly was retrieved by Edna Sargent and, with my permission, was permanently donated to the Adams fly exhibit appropriately located in the new library at Kingsley." Is the fly authentic? By all accounts, and by virtue of the documented lineage, I would say yes. The body of the fly was also examined and compared to a sample of the original wool material that Len Halladay used to tie the pattern (which was graciously donated to me by John Falk). It matched! There are many fakes and frauds out there, all of which claim to be 'originals' tied by Len Halladay. Although there may be a few held in private collections, I believe this to be the only known, authentically documented 'original' Adams fly. For this, the final chapter on the Adams, I leave you this message. If you are a fly historian, a devotee of the Adams or just a rambler of rivers; a pilgrimage to the Mayfield Pond and the Kingsley Library is a must for your bucket list…..
A special thank you is due to Ms. Edna Sargent who provided the contact information necessary to reach Dr. Gottwald and Mr. John Falk. To Dr. Gottwald, a special thanks for the documentation he provided which helped to trace the lineage of fly on display at the Kingsley Library. I am also in deepest gratitude to Mr. John Falk, Len Halladay's grandson, who helped with the historical information. I would also like to acknowledge Mr. Dave Richey who shared with me the portrait of Len Halladay.